The specification is designed primarily for fixed reception to roof-top antennas and has frequency spectrum channel characteristics that are compatible with with Geneva 2006 Agreement. DVB-T has been published as an ETSI standard, EN 300 744. It is built on top of MPEG standards for aiudio/video coding and multiplexing, which are used according to the MPEG guidelines technical specification ETSI TS 101 154. Many countries that have adopted DVB-T have published specifications for its implementation. including the D-Book in the UK, the Italian DGTVi, the ETSI E-Book and Scandivia NorDig. The compiler keeps telling me, “SSe instruction set not enabled”, although my CPU reports the sse and sse2 flags. What may I miss? I do not need to do this on my system and in any case this will eventually go by using VOLK implementation. I am getting following error when I tried to install from git clone. Please resolve my bug and thanks in advance. I the first glance it seems Volk is not found in the system by cmake. Please tell your system specs in term of OS type. Also tell if you installed Volk when installing/building gnuradio. 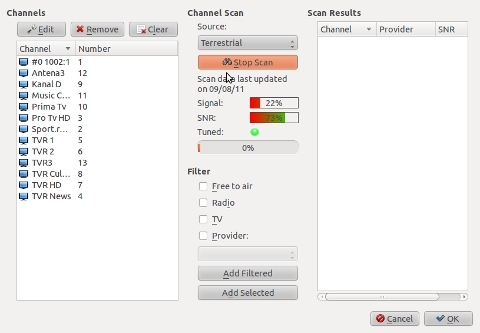 Can you help with this error of the libgnuradio-dvbt.so ?? I think everything was correctly instaled. I think I have installed everything correctly. When I try to run the project with USRP I have an error regarding the libgnuradio-dvbt.so file. “ImportError: libgnuradio-dvbt.so: cannot open shared object file: No such file or directory”. Please give a solution as soon as possible. We were also facing the same problem as your’s. We were able to find the solution for it. Just update the system using the command “sudo ldconfig”. Oh, this is indeed something to be done for the first time. Thanks for pointing it, I’ll add it to the docs on github. I confuse that how 2048 point FFT perform on 1705 carrier in 2K MODE? pad (2048-1705) zeros? pad at which locations?ETSI EN300744 did not point out that. and one more questrion, does gr-dvbt use USRP N210 as transmitter can emit the valid dvb-t singal that consumer dvb-t set-top-box(Sony “DVB-T/DVB-C” demodulator : CXD2817R) can receive? The 1705 carriers needs to be centered on the spectrum so there is zero padding on left and right of the useful carriers. does this gr-dvbt use USRP N210 as transmitter can emit the valid dvb-t singal that consumer dvb-t set-top-box can receive and play live successfully? 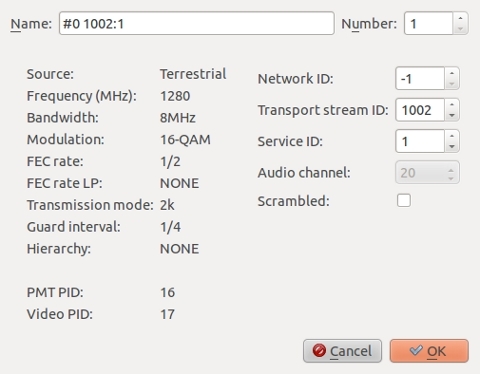 The answer is yes, you can use USRP N210 to transmit live dvb-t signal that can be received with off the shelf dvb-t receivers. The USRP needs to tune TX frequency in the range of the commercial DVB-T frequencies/channels. The above blog entry is just explaining how to do this with a regular RTL2832 based dvbt stick, though by using ham bands. shoud be need to do rate adaptation between the source and sink, but i did’n saw any block like that exist in the GNURADIO graph. Hi, the mpegts rate must match the calculated rate when sending and receiving real life signals. However, if you transmit the mpegts from a file, it will just be consumed by the TX chain at the required rate (31.67Mbps in your case) no matter the rate at which the video in the file is. If your mpegts file is at 4Mbps it will just be consumed and sent faster. When receiving with RTL2832u like above, the received data is buffered by the system and then played at rate in the video file in Kaffeine so it still works normally. 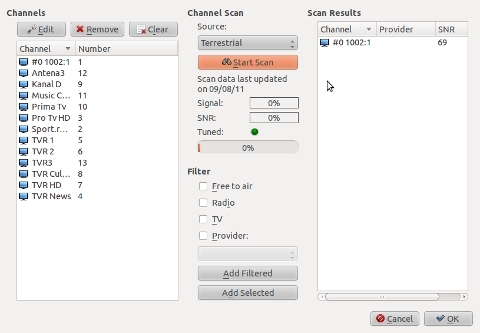 In the case of sending video from a camera there should be a rate adaptation for the video to obtain the required rate but this is not in the gnuradion flowgraph as it is part of the video system an not part of the dvb-t standard. in the dvbt_tx_demo.grc graph， there is a block call blocks_multiply_const_vxx， is it be use to constraint the IFFT output vaule to the USRP DAC dynamic range? and how it’s valule 0.0022097087 compute/come from? Sorry for bother you again. I guess that multiply with 0.0022097087 is used to constraint the ifft output value range to [-1, 1], and then use the uhd/convert to convert this float32 to sc16 by multiply the scale factor 2^15-1 = 32767, witch match to the 16 DAC dynamic range. in other to prove my guess, i compose the matlab script below, and find that ifft output value’s real/image is no larger than 0.4, so 0.4 * 0.0022097087 = 0.00088388, this multiple resulte is more less than 1, but not approximate to 1. is there something wrong i have made in this guess?